The only thing “small” about Small Business Saturday is the size of the businesses that participate in this increasingly popular shopping holiday. If you’re struggling to brainstorm awesome marketing ideas for a small business—or you’re getting a late start—Constellation is here to help! We’re passionate about supporting small business owners and want you to take advantage of these Small Business Saturday promotion ideas. If this shopping holiday is new to you, check below for some frequently asked questions. We’ll clear up any confusion and help you get on the road to participating in this year’s Small Business Saturday! Small Business Saturday is a shopping holiday held in the United States on the first Saturday after Thanksgiving during what is possibly the busiest shopping season of the year. As a counterpart to Black Friday and Cyber Monday—which promote large retail and e-commerce stores, respectively—Small Business Saturday encourages holiday shoppers to patronize small, local, brick-and-mortar businesses. The popularity of Small Business Saturday has increased exponentially since its inception. Small Business Saturday is part of the larger Shop Small initiative, whose goal is to create love and support for local businesses and to promote vibrant, diverse communities. Small Business Saturday is observed on the first Saturday after Thanksgiving. It immediately follows Black Friday and precedes Cyber Monday. When did Small Business Saturday start? November 27, 2010, was the inaugural Small Business Saturday. The event followed a widely publicized marketing initiative via social media, radio ads and public relations. Who started Small Business Saturday? American Express—in partnership with the National Trust for Historic Preservation, Boston mayor Thomas M. Menino and Roslindale Village Main Street—launched Small Business Saturday in 2010 as a way to celebrate and promote marketing ideas for small businesses during the always-critical Thanksgiving-to-Christmas holiday rush. How can I sign up for Small Business Saturday? You can help unite local businesses in your community as a Neighborhood Champion. If you’re interested in hosting events to rally your community around small businesses, sign up here. In addition, on Small Business Saturday, show your support for the local small businesses you already love, or find new ones, from food trucks to boutiques. If you’re a small business owner, celebrate your customers and attract new ones by offering Small Business Saturday–themed promotions, discounts, giveaways and social media campaigns. Why is Small Business Saturday important for my business? In an age where consumers increasingly shop online—not just during the holidays, but in general—Small Business Saturday is critical. Capitalizing on that peak holiday rush is one key to keeping your small business successful throughout the slow seasons. And remember that your small business helps the local economy thrive. 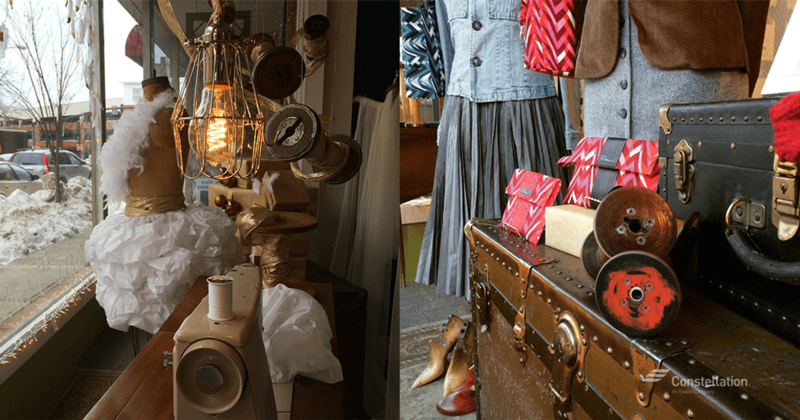 Unique gifts, genuinely friendly customer service and direct support for the local economy are squarely within the purview of small businesses. When your consumers get on board with this idea, everybody wins! This initiative is about more than just making purchases at small businesses. It’s about engendering widespread support for local economies and promoting diverse, thriving communities. This nationwide movement is fueled by shoppers, business owners and organizers who come together and celebrate their communities—because they know how much they matter. Small businesses come in a variety of forms, from family-run corner stores to food trucks to web-based boutiques. Employees range from 1 or 2 to up to about 150. If you want a successful kickoff to this critical holiday sales season, you need a marketing plan in place before the shopping rush begins. American Express offers a variety of Small Business Saturday marketing tips on its Small Business Saturday site. You’ll also find out how to sign up to receive downloadable materials for your business. Today’s consumers love Facebook, Twitter, Instagram and Pinterest. Expand potential awareness and increase engagement with these social media-based Small Business Saturday ideas. Use the Small Business Saturday hashtag: Hashtag posts with #SmallBusinessSaturday on your social media platforms to increase customer engagement. The #SmallBusinessSaturday hashtag has been in use since early 2010 and actually allows companies to promote business on any Saturday (not simply the one between Black Friday and Cyber Monday). Remember that on Twitter or Facebook, using more than two hashtags results in a significant drop in engagement, so stick to #SmallBusinessSaturday hashtag (or #SmallBizSaturday) and #ShopSmall. However, on Instagram, the more hashtags you use (up to 10), the more engagement you see. Download the Shop Small logo: Visit the American Express Shop Small site, and sign up to receive the Shop Small logo for your website. Use a location sticker with Instagram stories: New in 2017 is the location and hashtag stories feature on Instagram’s Explore page. If you use a location sticker or hashtag in your stories, Instagram will automatically curate those stories. To add a story to a public Explore story, simply add a public story to your account, tag it with whatever location or hashtag story you want to be included in, and post it—make sure to include the Small Business Saturday hashtag! For more tips on location and hashtag stories, see the Instagram Help Center. Do a special promotion or run social media ads: Choose a customer of the week, and feature him or her on your company’s Facebook page as a way to build engagement and shareability. Tweet about expanded hours, and offer special deals to early shoppers. Many social media sites have budget-friendly advertising options. Facebook, for example, can be as cheap as $1 to $5 per day, and small businesses can set a maximum budget to help control advertising costs. Consider running a promotional ad with the Small Business Saturday hashtag in the days leading up to Small Business Saturday. Don’t forget to send a newsletter! Promote your newsletter or blog through social media channels, and invite customers to sign up for special offers, new-product alerts or early notifications of sales. Go live! Tell your story on social media using Facebook Live, Instagram Live or other mobile video apps to attract new customers, one of the great marketing ideas for a small business trying to get exposure. Not every consumer out there relies solely on social media for marketing news or promotions, so take advantage of some old-school tactics and marketing ideas for small businesses to attract a wider demographic. Prepare some flyers ahead of time. American Express offers downloadable posters with the shop small logo and event flyers for your storefront. Get them here. Offer discounts for purchases that are in-store only. If your company has a website, offer your customers discounts on Small Business Saturday for purchases that are in-store only. Make it “Saturday only.” Run a promotion that’s available only on Small Business Saturday. Invite customers at checkout the week before to attend SBS. And for the most personal touch of all, invite customers directly. 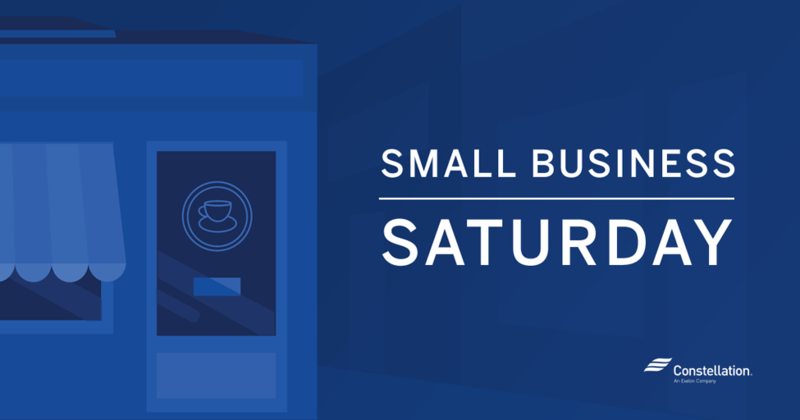 Prepare a short, friendly invitation—“We’d love to see you next weekend at Small Business Saturday!”—and coach your cashiers to spread the word. The sky is the limit when you put your creative juices to work. Take a look at these other Small Business Saturday ideas, and tweak them to work for your small business. Decorate your window with energy-efficient displays. As a national company interested in supporting small business owners, Constellation wants to help you save energy and stay safe as you create holiday displays that require increased lighting. Choose lights that have the Underwriters Label (UL), which shows they meet US safety requirements. Use the correct lights for their intended use: outdoor lights belong outdoors; indoor lights belong indoors. Check for frayed wires, damaged sockets or cracked insulation before installing your lights. Don’t overload electrical sockets; instead, use energy-efficient power strips (“smart strips”). When possible, use energy-efficient LED lights. Use a banner with balloons. Local shops, corner stores and food trucks have an advantage over big-box retail companies in that consumers on foot are more likely to step off the sidewalk and into a store that boasts a colorful banner advertising Small Business Saturday promotions with the shop small logo. Attach some balloons to your banner: they catch the eye—and the attention of kids! Offer coffee and other goodies. Shopping can work up consumers’ appetites! Offer coffee, hot cocoa and other goodies in your store on Small Business Saturday, or partner with a local restaurant or food truck to offer free snacks or discounted quick-meal options to keep your customers powered up. Show your customers you value them and care. Play music to attract new customers. Cheerful holiday carols help create a mood of excitement for the upcoming season—and all the shopping it entails! Engage customers by having them vote for their favorite holiday song, or partner with a local musician to play live music during peak hours. Create a holiday-themed display (such as Santa’s sleigh), or designate a spot in the store where kids can pick a small gift while Mom and Dad peruse other items in the store. If the kids are content, the parents are more likely to stick around and keep shopping! Push online sales through web-based promotions. If you want to push online sales, offer free shipping on that Saturday or for some other period during the holidays. Brainstorm “tough to buy for” shopping lists. The holidays are a time of joyful giving…but it can be stressful to choose the perfect present. What should you buy for the great-uncle you haven’t seen in six years? What about the friend who has everything or the sister who lives across the country? Chances are, your shop holds just the right treasure someone’s searching for. Help customers out by providing a list of gift ideas for people who are tough to buy for. Join forces with other local businesses. Team up with several other local businesses, share Small Business Saturday ideas, and get creative! For example, issue a “passport” with the shop small logo that consumers can get stamped or initialed at participating small businesses that allows them to win a prize or discount once it’s filled out, or they post a photo on social media using the #SmallBusinessSaturday hashtag. Consumers don’t necessarily have to make a purchase, but the exposure is a step in the right direction. A scavenger hunt is another fun way to bring customers into your local small businesses. Shoppers who complete the checklist could receive a discount at participating stores—and as they search for the list items, they might also find the perfect gift they’ve been looking for. Each year, millions of people already shop at small businesses, including retailers, restaurants and more. Since it began in 2010, Small Business Saturday has helped small businesses see a huge increase in sales. This year, take advantage of the unique opportunity to show your customers how great shopping local really is! ↓ Share these Small Business Saturday promotion ideas with your fellow local small business owners.